In this post, we examine some butter sprayers. These butter spray machines are used for heating and spreading butter, syrup, cooking oil, and other custom-ingredient toppings over a variety of foods like popcorn. Some sprayers use electricity to melt the butter in a special chamber, while other sprayers use pump action like a regular spray bottle to spray ingredients that are already liquified (Source). Butter sprayers are ideal for kitchen use when you want to melt butter and make syrup flow more smoothly quickly. Also, experts recommend using a sprayer where you add your own ingredients instead of a store-bought cooking spray, which may contain harmful chemicals (Source). In this article, we look at and compare five devices for spraying liquified toppings onto your food. The Presto Hot Topper quickly melts sticks of butter and margarine — even if it’s right out of the fridge. The thumb trigger pump makes it easy to dispense whatever topping you’re using. Thanks to a removable cord, this unit stores away easily. Lastly, immerse the Topper in water for easy cleaning. The Max Space butter dispenser dispenses butter in a ribbon fashion as opposed to a liquid spray. To use this device, put a stick of butter in the chamber and twist the handle to spread the butter. This unit works on sticks of butter that come right out of the fridge, so you won’t have to wait until it softens. If you find spreading cold butter frustrating, this is a great device to have. 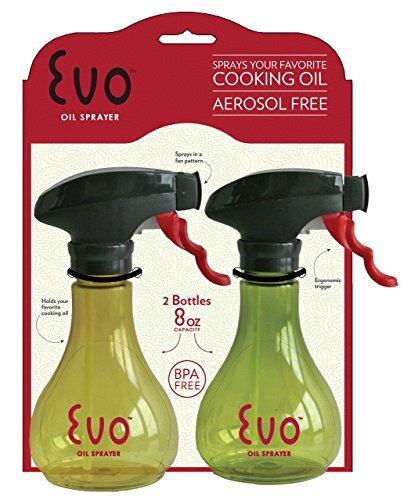 Next up is the Evo Oil spray bottle. 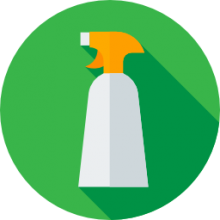 If you’re used to using aerosol oil spray products, this is a better choice since it doesn’t involve any chemicals or propellants, and is a healthier choice (Source). 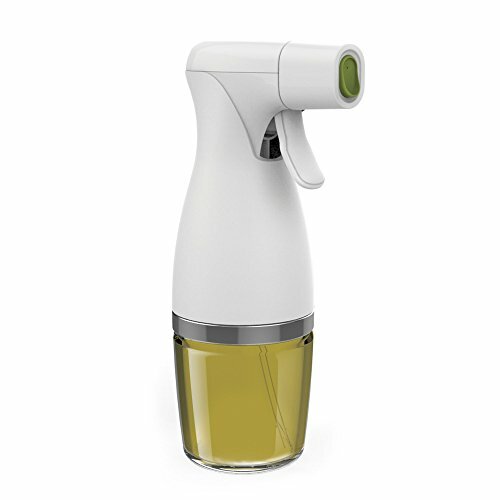 This unit is ergonomic, and the trigger pulls smoothly for even spray every time. This bottle is ideal for spraying cooking oil, vinegar, or homemade salad dressings. This spray bottle includes a twist-on funnel for easy filling, and it’s dishwasher safe. Another spray bottle for healthy cooking is the Prepara Trigger Oil Sprayer. Unlike the Evo, this bottle is glass rather than plastic. It’s also designed to accept a variety of oils. The unique spray handle varies the output according to how hard you pull. Pull slowly to get a fine mist, or quickly to get an even stream. Although designed for oil, some users melt butter in the microwave and then use the bottle to spray it on their popcorn. Last up is the Ideal Olive Mister-Sprayer. 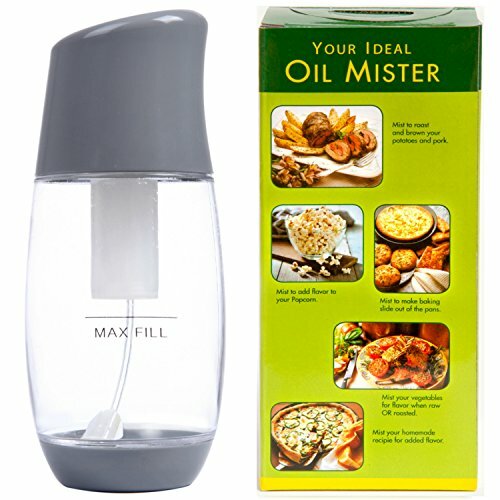 Like the previous spray bottles, this one is designed for smoothly spraying cooking oil over your salads or in your pans. The bottle on this model is made of plastic, which makes it less prone to shattering, especially if you want to take it along when you travel. What sets this apart from some cheaper misters is the design is made to last for years with no leaks or clogs. This sprayer is a good deal and comes with a 100% satisfaction guarantee. This automatic electric melter offered by Presto is well-designed, multifunction, efficient, and an excellent choice for butter, margarine, and other toppings. Users love the quality, but some do note that they received an old unit. The Presto hot topper features a thumb-action pump, which you can use to spray, stream, or brush toppings on the food. Another great thing about this product is that you can remove the cord for convenience and use it as a cordless unit. In addition to this, you don’t have to worry about cleaning because you can completely immerse it in water. You can also store the leftover toppings inside the appliance and put it in the fridge. 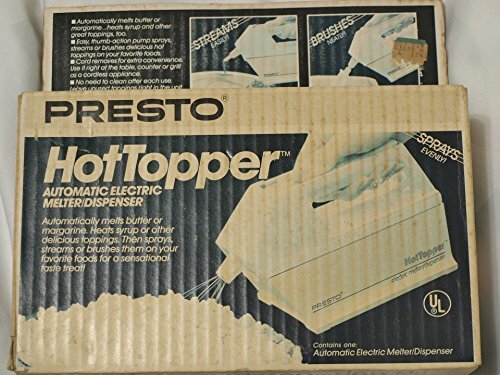 As a whole, users have a favorable opinion of the Presto automatic melter dispenser, and they don’t have any major complaints. A reviewer comments that the hot topper is perfect for spraying popcorns with butter and that it works fast. She adds that cleaning is easy and that if the nozzle plugs up, you just have to run it under hot water. Another purchaser mentions that this is the best automatic hot topper you can find and that operating it is a piece of cake. A buyer also notes that the device works perfectly and that it’s durable and sturdy. He highly recommends it and mentions that it’s a must-have for popcorn fans. 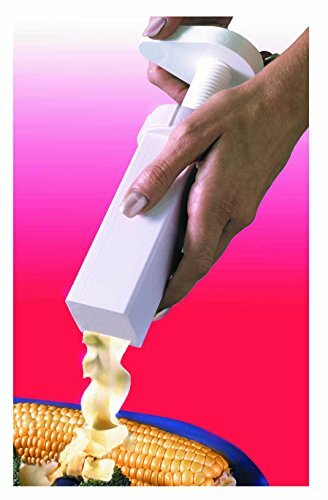 If you love popcorn and you’re wondering how to season them, you might take a look at this butter sprayer offered by Max Space. Users love the price, but some do note that the unit is made in China, although the design is American. The Max Space dispenser features plastic construction, and it measures 3” x 2” x 9”. Another great thing about this product is that it keeps leftover toppings fresh, and that operation is simple and straightforward. What’s more, you can toss it in the dishwasher when you have to clean it, and you can store it in the refrigerator. A reviewer comments that the butter sprayer looks sturdy and well-made and that she uses it almost every day with no issues. She adds that butter comes out in nice, thin strips and that she is very happy with her purchase. Another user states that it works wonderfully right out of the fridge and that she likes the bottom cap. A buyer also mentions that she had problems with the handle, but then she switched butter brands. She says that after that it takes no effort to sprinkle her toast or pancakes. However, a couple of customers have complained that the device is hard to use and that it’s difficult to fit a normal-sized butter stick. Some also note that the handle is almost impossible to turn and that you can break it easily. This oil sprayer offered by Delta is efficient, well-made, and an excellent choice for any cooking enthusiast or professional. Users love the ergonomic design, but some do note that they expected better dispense system. The Delta Evo 18-ounce spraying bottle features a unique fan pattern to cover more cooking surface, a BPA/DEHP-free plastic construction, and a twist-on funnel for filling and refiling. Another great thing about this product is that it dispenses 1/35 millimeters per pull for supreme control during cooking. It’s also available in a stainless steel model, and it’s dishwasher safe. A buyer mentions that she has started to use less oil since she purchased the dispenser and that she is very happy with its performance. She adds that it coats the pans evenly and that it’s easy to refill it. Another user states that the nozzle has never clogged and that it’s perfect for adding canola oil or butter on popcorns. She highly recommends it as one of the best butter sprayers available. Another purchaser observes that controlling the spray is a piece of cake and that she has saved a ton of olive oil thanks to it. However, some customers are disappointed because the bottle doesn’t spray evenly and the stream is too strong. Some also complain that they received the package without the spray part. If you are wondering how to add oil or butter to your dishes, you might consider this healthy eating sprayer offered by Prepara. Users love the unique trigger handle mechanism, but some do note that it breaks easily. The Prepara oil sprayer features a BPA-free plastic construction with a glass base, which is easy to wash, and it doesn’t require aerosol or pumping. Another great thing about this product is that you can control the stream by pulling the handle quickly (fine, even mist) or slowly (an even stream). What’s more, you can keep track of how much oil you’re using because a pull dispenses a 1.4 teaspoon. As a whole, users have mixed opinion of the Prepara vegetable oil sprayer, and they agree that the design needs improvement. An unhappy reviewer comments that the plastic nozzle lasts less than two months due to the efforts needed to pull the trigger. Another buyer also shares that he expected better spraying system and that it squirts too much oil at once. On the other hand, a happy buyer mentions that the device works perfectly as a butter sprayer, but says that you have to melt the butter in the microwave. She adds that it’s far more useful than she expected and that it’s better than plastic versions. Another one also shares that she loves the two spraying options and that the unit is easy to clean. This oil mister offered by The Fine Life is easy to use, multifunctional, compact, and an excellent choice if you’re making a BBQ. Users love the lightweight construction, but some do note that the it’s overpriced. The Fine Life sprayer features an FDA-approved air pressure system, which will eliminate chemical propellants, a comfortable grip, and a clear container. Another great thing about this unit is that it produces a fine mist to coat your dishes, and it has a 100% guarantee. What’s more, the product is available in three different colors. As a whole, reviewers have a favorable opinion of the Fine Life mister, and they praise its design, functionality, and usefulness. A buyer shares that she has been using the sprayer for more than six months and that it hasn’t clogged even once. She adds that it’s one of the best oil misters you can find and that she is going to buy another one. A user also comments that she is satisfied with the performance of the unit and that it produces an even mist that doesn’t make a mess in the kitchen. Another purchaser states that it doesn’t sputter and that you can wash it with warm water to clean it. However, a couple of customers have noted that the unit produces mist only in the first couple of weeks, then it starts to spray heavily. Some also complain that it’s not as durable as they expected. Doesn’t use any chemical or artificial propellants, simply heat, and air. Can be kept in the fridge or on the counter-top. Nozzle developed to avoid clogging. Much easier than spreading butter using silverware. Does not overheat causing the butter to melt. Works with any style of real butter. Will not melt the entire stick. Melts just the butter you will need and signals you when you should add butter. Accelerometer understands when you’re picking it up to use and begins heating the Biem immediately. Simple to use. Simple to clean. Over in the cooking section of Reddit, one user was wondering what the best brands of butter actually are and whether they are truly worth the price. On option he saw, the Biem butter sprayer, was particularly expensive, he thought. He says, that it in his experience, things like eggs and milk, you don’t need to spend a lot of extra money on them because the quality is somewhat standard. One user suggested Kalona Supernatural- They explained that it is a grass finished option that has a taste reminiscent of Parmigiano Reggiano. Kerrygold was another suggestion. They particularly like that with grass-finished options that the yellow coloration 10 is actually natural and not an added on feature. If you try and spreading them onto a piece of toast, this user says that it creates a dizzying and glorious taste for your mouth. Other users said that while Land of Lakes is a decent option if you’re using it for cooking. Another user said that at their Starbucks they use Kerrygold inside of the butter packets they serve with bagels and bread – that might be a good place to try it out if you’re unsure about purchasing in bulk. Another user said that he had recently visited Island and says that he had never tasted such fresh and delicious butter in his entire life. A person from Ireland chimed in saying that they began creating their own butter using double Irish Cream and found that it was so delicious they had to put a stop to it because they were beginning to gain a lot of weight. Another poster says that Kerrygold isn’t available in Wisconsin because the state has regulations regarding authorized inspections so that it can legally be sold there. There are a bunch of grass-fed options you can look for if you’re in an over-regulated state, such as Organic Valley Pasture, Anchor Butter, Allgau German, Smjor, and Humboldt Creamery. Another poster solicited the cooking community about the differences between regular and European butter. Specifically, he was comparing generic unsalted with the European style and he wasn’t quite sure what the difference was. One of the primary differences, a user said, was that the EU style has a higher fat content. Another user in the cooking community was wondering why a lot of cooking recipes require unsalted butter- he says that it’s pretty flavorless, in his opinion, so he frequently opts for the salted variant instead. One user said that if you’re just using it to spread on some bread, a salted style is good, but for cooking purposes, it can effectively over-season your food. Another user said that it is a lot more difficult to actually remove salt from a dish and then add it in, so if you’re starting off with salted butter, you have a lot less control over the amount of salt in your dish. Another user had a historical perspective, saying that their grandparents despise the salted version. This is because the salt enables for a greater degree of water retention and back during World War II there were a lot of people selling poor quality butter on the black market. Another user had a contrarian perspective, saying that in his experience there’s only about a third of a teaspoon of salt included in a single stick of butter. That means, that in his opinion, it’s not too big a deal to use one or the other, even for cooking. Most recipes are going to require salt, so if you use a salted style, and are seasoning it to taste, you’ll be able to tell pretty quickly whether you need to and how much salt to add to your dish. Another interesting observation he made was that salt will actually protect the butter’s flavor.